ATLANTA – Thirty-seven year-old Tonya Pinkston was raised by her parents to get a good education, a good job and to contribute to society. But something happened while she was climbing that ladder to success – she was laid off three times. "I have a college degree, but I never dreamed I'd be faced with no job security and wondering how I'm going to feed my family," said the single mother of an eight-year-old daughter. It's becoming is a hauntingly popular refrain, some observers say. Pinkston was just one of several panelists who testified at the Speak Out for Jobs event held recently to provide a forum for Atlanta's unemployed and underemployed. Community activist and WAOK-AM personality Derrick Boazman said the forum – held at Trinity United Methodist Church – was an eye-opener for some observers. "When you're used to eating three meals a day, you sometimes forget about those who can't," Bozeman said. "But now there are people who had big cars, big houses, and 401-ks who now find themselves in line at Hosea Williams Feed the Hungry," he said. "So we're all in this together." Metro Atlanta lost more than 12,000 jobs in 2010, statistics show, and its unemployment rate was 10.4 percent for the first quarter of 2011. That's why the 9 to 5 National Association of Working Women and Atlanta Jobs with Justice decided to sponsor the Speak Out event. "This event is about unity. 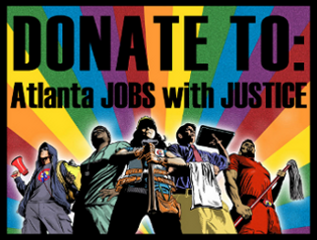 If we unite, we can make some changes and help create jobs," said Atlanta Jobs with Justice Coordinator Tony Romano. "We believe everyone deserves a job with dignity." To get the crowd started, he yelled, "Don't bite your tongues – call a spade a spade. Now, let the Speak Out begin!" 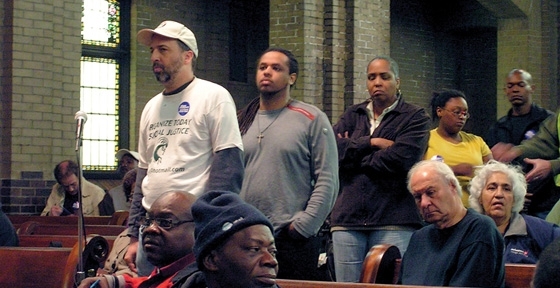 Participants formed long lines at two microphones to give their testimonies. One man said he was unemployed and living in a shelter, but when he goes to fill out a job application, they won't accept it because he can't use the shelter as an address. Another participant, Dracy Blackwell, tugged at the audience's heartstrings when she told of how four years of unemployment has devastated her husband. "It's been really hard on him. Sometimes he's suicidal," she said. "I want to see him feel like a man again." Some observers offered solutions and hope. One woman talked about becoming an entrepreneur by selling Avon. And a former homeless man said he now is working for the Homeless Task Force. "Don't give up hope!" he shouted. One 17-year old girl noted she'd been looking for work to help her mother, who is a single parent. "Just the other day all of our electricity was cut off," she lamented. To help relieve the pain, State Sen. Nan Orrock told the audience she's fighting to make Georgia sign President Obama's bill for extended unemployment benefits. Romano added, "Our next step is to try to defeat the anti-immigration bill, which also affects jobs, and to keep holding events like this so we can videotape testimonies and put them on You Tube. We're hoping this will help us find solutions." 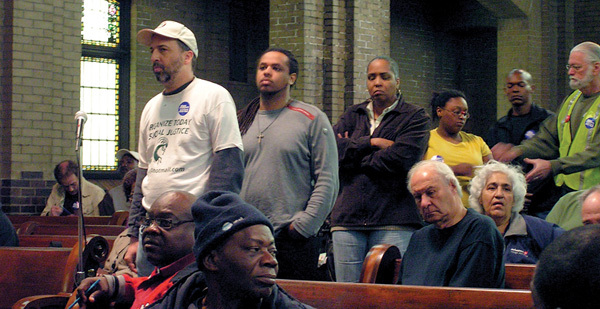 State Sen. Vincent Ford advised attendees to boycott the lottery. "Lottery ticket money comes from the working poor community," he said, "but you don't benefit from it." After the program, organizers provided free lunch and free services, including: legal aid, resume help, food stamps and Medicaid applications, career counseling, child care, housing, health screenings, and even free massages and haircuts. One participant, Alvin McCordy, said he was happy to get a haircut for an upcoming job interview. "The barbers treat people like me with compassion," he said. "I'm going to feel better and look better." One barber, Siegfried White, said he doesn't mind offering free cuts on a Saturday – the day that barbers usually make the most money. "Someone did this for me when I was going through my transition and I wanted to give back," he said. Another barber, Gene Grisby, said participating in the program has become like a ministry for him. "I used to be homeless too," he said, "so I try to give these brothers some hope to let them know if I can make it, they can make it, too." For her part, Pinkston said despite he dilemma, she remains encouraged and is considering starting her own business. She won't give up, she said, and read a poem that ended with the inspiring phrase: "Faith is everything." 1. Yeah nice post : D you have got a cool way of explaining stuff. I really see your point.